When most people think of treating infections, they think of antibiotics. But antibiotics only work against bacterial infections. Most common infections, like colds and flu, are viral and antibiotics have no effect on viruses. Most coughs, sinus problems, ear infections, sore throats and other common contagious diseases are viral in nature, it's a waste of time and money to treat them with antibiotics. Viruses don't just cause colds and flu. Chicken pox, mumps and measles are all acute viral infections. 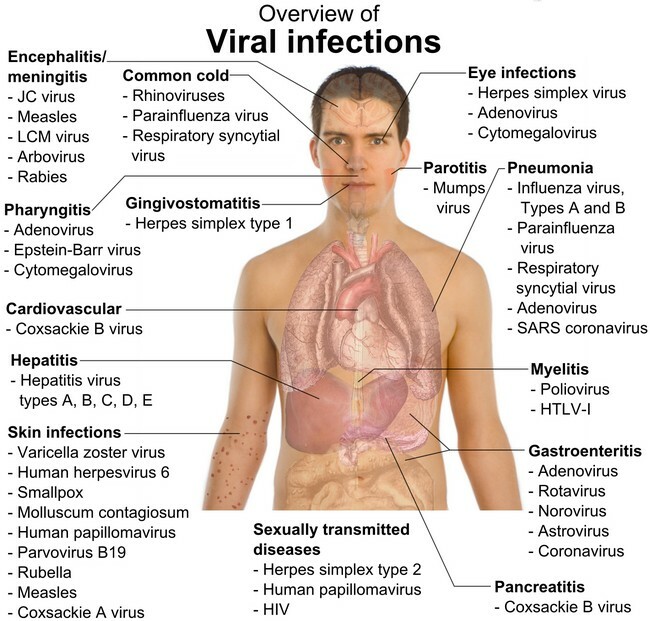 There are also chronic viral infections like herpes and more serious and dangerous viral infections such as smallpox, hepatitis C. Epstein Barr, SARS, AIDS and Ebola. The reason serious viral infections raise concerns is because modern medicine has very few effective antiviral drugs. Most drugs only relieve the symptoms of viral infections. So, when it comes to viral infections modern medicine focuses its efforts primarily on trying to create immunity to them through vaccines. It is important to understand that a virus is very different than a bacteria or fungus. A bacteria, fungus or yeast (like Candida albicans) is a single celled organism. It feeds and grows, then divides to reproduce. However, viruses are not cells! They are pieces of DNA or RNA wrapped in a protein coat, having none of the structures or processes that cells have. So, there is some debate about whether viruses are alive or not. That is because outside of a living cell, a virus is inert. In order to replicate itself, a virus must enter a living cell and hijack cellular mechanisms that make copies of the DNA or RNA. So, a virus has no "life" outside of another cell. It doesn't grow or metabolize nutrients or perform other functions that cellular organisms do. This means you cannot"kill" viruses in the way one can kill a bacteria or fungal cell. Your body combats viruses in several ways. First, the innate immune system, found primarily in the membranes of the digestive and respiratory system is designed to destroy foreign material (like viruses) to prevent them from ever entering the body. So, a healthy intestinal and respiratory system forms a protective barrier against most viral infections. If a virus is able to get past the in innate immune system, then the adaptive immune system takes over. It produces substances called antibodies that attach themselves to a virus and render it inert so it cannot enter cells and disrupt their normal functions. Because you cannot "kill" viruses, there are no broad spectrum antiviral drugs or herbs. Herbs that have broad acting activity against viral infections are those that support natural immune function. They boost production of white blood cells and antibodies, strengthen mucus membranes and increase white blood cell activity. This helps the body fight infections of all kinds—viral, bacterial and fungal. This is one way herbal remedies have a huge advantage over pharmaceutical drugs. is to treat one. Basic hygiene, such as washing your hands or covering your mouth when coughing is the first line of defense. For added protection, Silver Shield Rescue Gel makes a good hand sanitizer. You can also make your disinfectant soap by adding essential oils like eucalyptus, myrrh, sandalwood and thyme or the Essential Shield or Guardian blends to Sunshine Concentrate. Diffusing these essential oils in the air can also help to prevent the spread of airborne viruses. Who are lacking in certain nutrients are much more likely to develop a viral infection than people who are well nourished. Nutrients known to help inhibit viral infeccions include vitamin A, vitamin C, zinc and selenium. One of the reasons people may be more prone to viral infections in the winter is because tehy have lower levels of Vitamin D3. This vitamin is considered number one nutritional deficiency in America. It has been estimated that about 90% of the population is deficient. So, to reduce your susceptibility to viral infections try one or two 4000 IU tablets of Vitamin D3 daily. Many people are so deficient that three or four tablets is better. One can also take one or two gel caps of Vitamin A&D, which contains 10,000 IU of Vitamin A 400 IU of vitamin D. Vitamin A strengthens the mucus membranes, the primary route viruses enter. If the virus cannot get past the mucus membranes and into the body, you cannot get sick. The following may be helpful in combating viral infections. Mixing a drop or two of an antibacterial essential oil into a little black salve makes a good topical application for skin infections. One can also add essential oils to Silver Shield Gel.